of opioid or substance misuse disorder. West Boylston – Worcester County Sheriff Lew Evangelidis has announced the Worcester County House of Correction has been selected by the Massachusetts Department of Public Health to be the recipient of a $100,000 Grant Award to fund addiction treatment and services for incarcerated individuals with an opioid use disorder who are within two months of release. The new program known as Medication Assisted Treatment Re-entry Initiative for Houses of Correction (MATRI-HOC) will provide support services and access to medication-assisted treatment as well as community based resources. 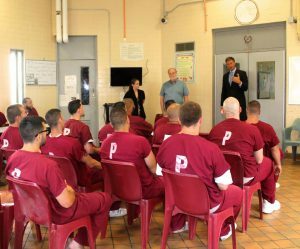 The grant was one of five awarded to Masschusetts jails to help inmates suffering from opioid addiction. The funding will provide the Worcester County House of Correction with the increased ability to place diagnosed opioid dependent inmates in a medication assisted program including case management and counseling to help reinforce recovery and re-entry into society. With current estimates of incarcerated individuals suffering from substance abuse and addiction disorders as high as 90 percent, the MATRI-HOC grant will provide additional resources for Vivatrol therapy, an injectable drug that is non-addictive and helps to prevent relapse with opioid addicted individuals. Currently offering Vivatrol on a small scale, the House of Correction will expand the current number of inmates who are diagnosed with an opioid use disorder into the program. Inmates eligible for the program must have a diagnosed opioid use disorder and are due to be released within 60 days. Each individual will receive a clinical assessment and will be assigned a case manager to develop a treatment/recovery plan, including Medication Assisted Treatment when appropriate. Case management, treatment and recovery support services will be available to each participant for up to a year following their release. “As one of only five correctional facilities in the state to have been selected for the Massachusetts Department of Public Health MATRI-HOC grant, we are pleased to have additional resources to fight this tragic epidemic.” Said Evangelidis. “According to the most recent data, inmates with a history of opioid dependency are at 56 times higher risk of opioid overdose death following their release as compared to the general public. This grant will support proven and effective treatment options at our jail which will not only save lives among this population but through achieved and maintained sobriety make our community a safer place.” Said Worcester County Sheriff Lew Evangelidis.